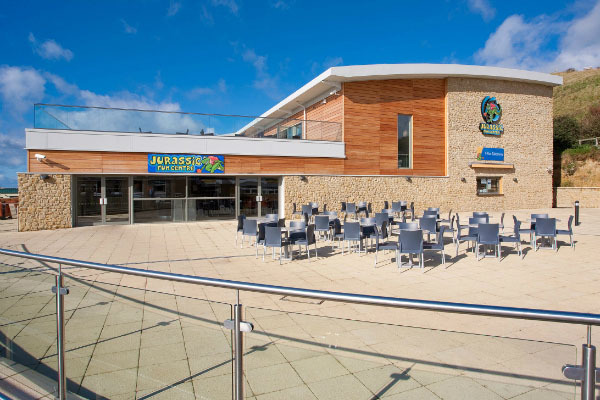 On Dorset’s spectacular Jurassic Coast, The Freshwater Holiday Park near Bridport is proving to be no dinosaur and is setting itself apart from other campsites with a brand new £3.5 million leisure complex. In a building which is subjected to the best and worst of British weather, the design had to incorporate insulation versatile enough to withstand the dramatically changing weather and climate conditions. High performance floor and wall insulation from Celotex met the challenge by helping to create a thermally efficient building envelope which was unaffected by temperature cycles. Designed by HPW architects and built by Vear Construction, the 2000m² multi-use leisure facility forms a welcome addition to this popular holiday park. Close to Freshwater Beach, the leisure building includes an indoor swimming pool with slides, a water play area, hot tub, steam room, gym, treatment room, six lanes of full size American ten pin bowling, roof terrace, and bar. The steel framed building has been designed to combat the extremities of the coastal climate and offer high levels of energy efficiency, keeping fuel bills low and minimising wasted carbon emissions. Sub contractor, Woodmace Civil Engineering installed 600m² of 100mm thick CW4000 within the cavity walls and 1500m² of 50mm thick Celotex GA4000 beneath the concrete floors. Made from PIR (polyisocyanurate) with foil facers for improved emissivity, Celotex CW4000 achieves a lambda of 0.022W/mK, helping the project meet the desired U-values. 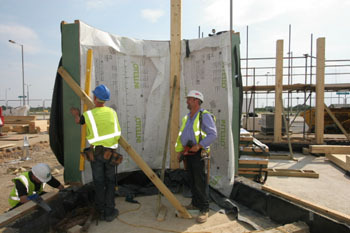 Celotex provided 100mm thick CW4000 for the cavity block walls of the steel framed building. These durable and lightweight boards, available in a range of thicknesses from 25mm to 100mm and a standard board size of 1200mm x 450mm, are easy to cut to fit using hand tools. In conveniently sized boards for installation between cavity wall ties, once clipped into place, the block walls were built and the exterior of the building was clad to create a weather tight envelope. To insulate the floor and to avoid loss of heat, 50mm thick Celotex GA4000 was laid on the structural base then covered in poured concrete. Suitable for use in a number of applications including roof, wall and floor systems, Celotex GA4000 has also achieved an A+ rating when compared to the BRE Green Guide 2008, and is available in a board size of 1200mm x 2400mm and a range of thicknesses from 50mm to 100mm. Mortar from CPI EuroMix has been specified for the extensive facing brickwork at Norwich’s new City Academy. 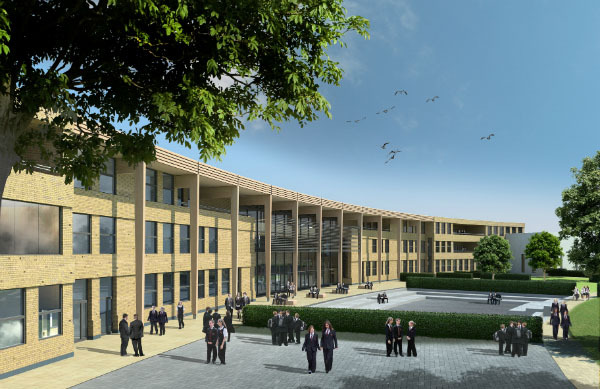 Designed by architects Sheppard Robson and being built by main contractor Kier, the three-storey, 11,000m2 Academy is being constructed in the grounds of the old Earlham High School. A back-to-back crescent formation, with the main teaching wall facing out across the school fields, the building has been constructed with a central steel spine and cross-laminated timber external walls, floor and roof panels. The external walls, all of which gently curve, are being clad with facing brickwork, for which a reliable supply of mortar was required. For the main academy walls, mortar was required that would match the yellow brickwork whilst for the building’s wings, which are faced with stone, a contrasting mortar was required. To achieve the desired aesthetics, CPI EuroMix is providing two colours of mortar – straw yellow to blend with the yellow brickwork and black for the areas to be faced in stone. Working with specialist brickwork contractor Osborn Brickwork, CPI EuroMix is providing the mortar in its innovative silo mixing stations. Capable of holding up to 35 tonnes of dry mortar, the silo mixing station is delivered to site where it is plugged into water and power. As required, at the simple touch of a button, the silo produces a perfectly mixed mortar. As well as maintaining mix and colours, particularly important on a project where colour is a key element of the design, the system also minimises waste. All of CPI EuroMix’s products, which include mortars, renders, screed, grouts and concretes, are manufactured to BS EN ISO 9001:2000. Once complete the Academy will feature a new sports hall, for Academy and out of hours community use, Faraday science, art and design technology workshops, along with a full complement of traditional teaching spaces. As part of the school’s commitment to creating a sustainable facility, the Academy will incorporate a district heating system linked to the University of East Anglia, as well an extensive range of photovoltaic cells on the roof and a limited system for rainwater harvesting which will also be used as an educational tool. A new low carbon public exhibition centre at Longstanton park and ride in Cambridgeshire is the first major application of Lime Technology’s thermally efficient Hembuild, a pre-cast wall system incorporating Tradical Hemcrete, a renewable material made with hemp with a lime binder. Designed by Rees Pryor Architects for client Cambridgeshire County Council and built by contractor SEH French, the project involved the creation of a waiting room and associated facilities for park and ride users, as well as an exhibition space which showcases renewable and low carbon technologies. This innovative and thermally efficient new building will become a learning resource that will showcase green technologies and is targeted to achieve an excellent BREEAM rating, the first in Cambridgeshire. The high level of thermal efficiency is testament to the technologies used in the construction and operation of this building which include photovoltaics, a ground source heat pump, green roof and 220m2 of Hembuild. Hembuild is a factory produced system that consists of a timber cassette filled with Tradical Hemcrete. The timber cassette forms the buildings structural frame, for low rise (up to three-storey) buildings to be created. Hembuild can be supplied in a range of U-values from 0.10 to 0.22 W/m2K to provide a thermally efficient building envelope. Its unique thermal inertia means that the building has a very stable internal environment and greatly reduces the energy use. Its offsite production process and use of renewable materials also has minimal environmental impact making the system ideal for the new low carbon public exhibition centre at Longstanton park and ride. By using Hembuild customers get the best of both worlds – modern methods of construction and inherent sustainability – with a quick build and a predictable programme at all times of the year, giving the thermal advantages of solid wall construction in a build time of lightweight timber frame. A new low energy housing development in Swindon, built from Lime Technology’s Tradical Hemcrete, is set to feature on a two-part Channel 4 series, which started on December 8. The series, Kevin’s Grand Design follows broadcaster and designer Kevin McCloud as he sets out to prove that it’s possible to create beautiful, contemporary and sustainable homes that are also affordable. The Triangle, a high quality sustainable 42 home development from Hab Oakus – the partnership between Kevin McCloud’s company Hab and GreenSquare – is set to achieve Level 4 of the Code for Sustainable Homes, but with the potential for upgrading to higher levels. The development demonstrates Hab Oakus’s aim to produce innovative (but not experimental) schemes that will achieve very high standards of design and sustainability. Lime Technology’s Ian Pritchett said: “We were delighted to have the opportunity to get involved in this project, not least because it gives us the chance to show off the fantastic properties of the building material and to show that Tradical Hemcrete really is a viable alternative to traditional building materials. Tradical Hemcrete, is a mixture of hemp and a lime binder, which together create a material that combines sustainability with performance. A highly thermally efficient material, Tradical Hemcrete locks up CO2 and when used with lime based renders and plasters, creates a breathable walling system for healthy living. Able to be mixed on site for fast track construction it provided Hab Oakus with an innovative, sustainable and efficient way of creating the structure of the homes at The Triangle. Designed by Glenn Howells Architects and built by Wilmott Dixon Housing, The Triangle has been built on the site of a former caravan park and plant nursery, just off Swindon’s Northern Road. Hab Oakus hopes to ensure the sustainable development acts as a springboard to introduce green initiatives locally. A mixed tenure scheme, consisting of homes for sale, shared ownership and affordable renting, The Triangle is being used as a prototype for Hab Oakus’s proposed larger second scheme which will see the delivery of around 200 homes at Pickard’s Small Field, Gorse Hill, Swindon. Veka customer Glaze4trade and Network Veka member Delta Plastics have won the contract to supply and install the windows on a new-build housing estate in Dorset, which is claimed to be the largest 'passive housing' estate in the UK. Delta's MD Philip Chick said: “Passive houses are a German concept just becoming popular in Britain; these houses use your body heat and that of your possessions to warm the whole building without the need for central heating. A big part of the insulation process these houses require is triple glazing, which we were able to install with the help of our supplier Glaze4trade. “We have worked with Lomand Homes, the developer, on several smaller jobs in the past and they were always pleased with the quality of our materials and workmanship. It was on this basis that they asked us to tender for the project. “The development is still in progress and, to date, we have fitted approximately 150 triple glazed windows, a dozen French Doors and several composite doors. Upon completion, we will have fitted in excess of 600 windows. The eco-friendly development is being referred to as Pennsylvania Heights, as the site is located directly opposite Pennsylvania Castle on the Isle of Portland. Total Glass is supplying its high-security communal entrance doors to Salford’s City West Housing Trust as part of an on-going £multi-million homes investment programme. Manufactured from heavy-gauge aluminium to the highest UK specifications, the Power Frame doors are being installed by main contractors Morrisons and Enterprise in dozens of low-rise housing blocks across the city. Specifically designed to withstand the toughest environments, all doors feature robust hinges, fully tamper-proof fixings and secure electronic solenoid bolt locks linking to video and entry phone systems; providing the highest levels of security to protect occupants. Laminated and toughened glass in the large glazed panel delivers high impact resistance and safety, while also achieving low U-values depending on glass specification. This greatly improves heat retention within communal areas, reducing heating bills and carbon emissions. Glass can be customised with corporate designs and logos if required. Enhancing buildings with their contemporary and welcoming appearance, the doors let more light into communal areas and give residents an immediate, reassuring view of visitors outside. Greater visibility helps to reduce the potential for anti-social behaviour and vandalism. Holding PAS 23, PAS 24 and Secured by Design accreditations, the Total Glass Communal Entrance Door won Product Innovation of the Year in the 2010 Builder & Engineer Awards. City West director of asset management, Colette McKune said: “Having considered the whole-life costs, the Total Glass communal doors met our specification for robust, future-proofed and high-security products that offer long-term performance. 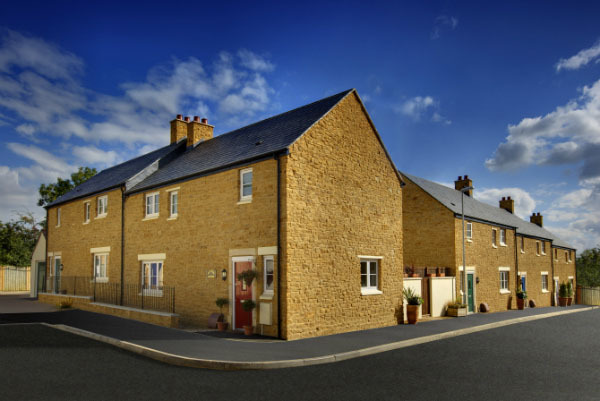 Building a new development called The Shires in Yeovil, Midas Homes looked to provide superb energy efficiency, achieved in part by specifying insulation from Celotex. Built on the site of an old garden nursery, The Shires comprises 33 homes, split between larger four bedroom properties and two bedroom coach houses. 3,500m2 of 50mm Celotex CW4000 was used in the cavity walling of The Shires’ houses because it offers impressive low lambda values along with moisture resistance, ease of use on site, low global warming potential and zero ozone depletion potential. 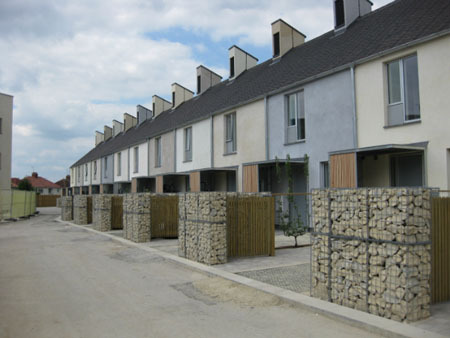 The boards were easily installed in the masonry wall cavities of the houses at The Shires development. Though hard wearing, Celotex is exceptionally lightweight and can be easily cut to requirements on site with a saw. Held in place with wall ties and clips, the low emissivity of the boards and their dimensional stability ensure that they will provide long lasting insulation. Houghton’s new £21m Primary Care Centre is now open to the public. The fourth centre of its kind to be built in Sunderland, has been developed by NHS South of Tyne and Wear, working on behalf of Sunderland Teaching Primary Care Trust (PCT) and will improve access to health services for local communities. Gloucestershire based Ecovision was commissioned to design and install a renewable energy solution. After an initial consultation period it was decided that the most efficient system to provide both the heating and cooling to the building was to install two Ecovision 245kW Ground Source Heat Pumps. A motorised valve control strategy enables the non-reversible heat pumps to provide cooling as well as heating. The ground source heat pumps are used to generate the low temperature heating water for the space and air heating systems throughout the winter, with a capacity of approximately 450kW. During very cold days a gas boiler system is used to top up the heat pump output on the secondary side of the heat pump buffer vessel. The heat pumps are also used for pre-heating the mains hot water. The initial pre-heat is undertaken by the solar thermal array on the roof and where the performance of the solar thermal array is not sufficient to preheat the incoming cold water, the ground source heat pumps heat the water to the required temperature within the pre-heat vessel. During the summer the heat pumps will provide chilled water for the mechanical ventilation system. The heat pump system is designed to provide the full cooling load of 510kW, with the heat pumps being connected to the borehole field outside the building under the car park. In total there are 104 boreholes, which are 110 meters deep. The boreholes are headered-up via four manifold chambers, which are linked together inside the plant room. “Ecovision worked closely with Wilmot Dixon, the principal contractors, to design a system that would supply precisely what the Care Home required. It was a complex and highly technical installation which needed to provide heating and cooling at different times of the year. As a result of the heat pumps the NHS will make significant savings on running costs as well as significantly reduce their carbon emissions.” Julian Sowerbutts, managing director of Ecovision said. 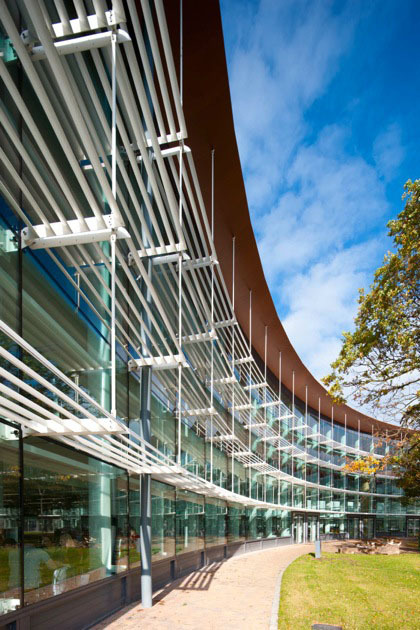 LouvreSol SP provided and installed the extensive brise soleil array around the South Cheshire college, constructed in the form of a crescent around a mature copse of oak trees. Designed by Jefferson Sheard Architects, the building was designed to minimise its carbon footprint and achieves a ‘very good’ BREEAM rating. The large and expansive use of glass has been designed to create a sense of continuity between the natural environment outside, the copse, and the human environment inside. The solar shading helps to reduce solar gain and solar glare within the communal area of the atrium. In conjunction with the brise soleil, the build requirement was for a low carbon footprint for the project. This in turn required the architects to maximise use of natural ventilation and daylight penetration, to build in night cooling, include rainwater collection and re-use, and to use solar thermal collectors, ground source heat pumps, and motion sensor lighting. All these strategies have helped to reach the BREEAM rating. To enable secure daytime ventilation and nigh time cooling of the atrium, LouvreSol SP supplied and installed its new LouvreWall system which is located at the bottom of the glazed crescent facade at ground level. The wide insulated louvre blades are opened by the Building Management System (BMS) when solar gain in the atrium is identified. In the evening the louvre blades open for a predetermined time to help flush warm air out to be replaced with cool fresh air for the following days occupancy. LouvreWall is believed to be the largest spanning, motorised and insulated ventilation louvre system available on the market. North East based renewable energy company Opus Green is underway with a £1.9m contract with Your Homes Newcastle (YHN) to install rooftop solar energy systems on over 30 of the housing blocks it manages. The contract to design, supply, install and commission solar photovoltaic installations (solar panels) includes 30 buildings across Newcastle city centre, stretching across a number of housing estates in Elswick, Kenton, Shieldfield and Newburn. The installation of solar panels will lower YHN’s carbon footprint and also generate revenue under the Government’s Feed In Tariff scheme (FITs). Earlier this month Opus Green used an 80 Tonne crane to lift 260 solar panels onto the rooftops of the first three multi storey blocks of flats in Elswick. Managing director of Opus Green Chris Cassells who was on site to oversee the operations said. “Close collaboration with YHN and their residents has helped us meet the logistical challenges of installing approximately 260 solar panels and associated equipment onto the rooftops of three blocks of flats of up to 5 floors in Newcastle,” he said. “Careful planning together with structural and electrical appraisals had to be undertaken to ensure the systems complimented rather than compromised the environment they were being installed in. The Pilkington Planar system has been specified for the glass atrium in an extensive redevelopment project at St. Helens College. The Pilkington Planar technical and design team worked closely with the client and its design team to develop a modern innovative building to reflect the forward looking ethos of the college. The College’s ageing town centre campus had to be demolished to make way for a new state of the art learning complex, while the existing Smith Kline Beecham buildings were refurbished. The resulting Pilkington Planar facade maximises the natural light which adds an environmentally friendly dimension to the new build, and it incorporates energy-saving sustainable technologies through passive rather than engineered solutions. Across all three phases of the development Pilkington Insulight high performance insulated glazing units were also supplied, totalling in excess of 3000m2. This glass was incorporated into the design of the building to assist the client in achieving their design goals. In addition the Brook Street (east elevation) and Court Yard (west elevation) main entrances to the new development were glazed using the Pilkington Planar structural glazing system providing striking facades to the building while incorporating high performance energy-management glazing, ensuring that the building is aesthetically pleasing but also energy-efficient. Roth UK has secured a series of ‘major contracts’. 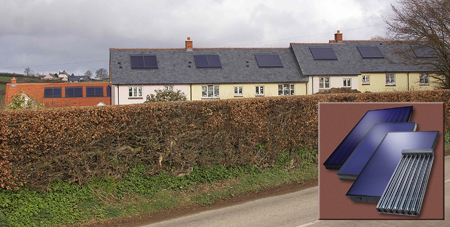 Recent orders for the system, which includes Roth’s single panel in-roof kit, include major contracts placed by Summerfield Developments for its Cutcombe housing scheme on Exmoor plus sites at Williton and Bower Hinton. Roth UK was pleased to host visits from Summerfield Developments at its UK centre, where kits were viewed and instruction was provided. The Roth product range includes solar thermal solutions and interchangeable multilayer polymer pipe ranges for cold/hot water supply and heating/cooling pipework systems. Supported by nine manufacturing plants in Europe, and 1,100 employees worldwide, Roth’s expertise encompasses residential, commercial and industrial applications. Swish Window and Door Systems has been specified and supplied on a unique new property, built on the site of a former toilet block and featuring advanced levels of thermal and acoustic insulation. 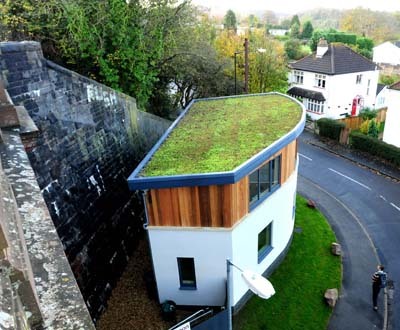 The corner plot in a Bristol suburb has been transformed as the site of a modern sedum-roofed and cedar-clad three bedroom property. Its position in close proximity to a dual carriageway meant the acoustic performance of the building envelope was a critical part of the design process. 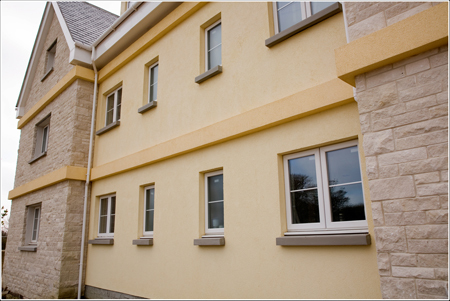 Windows in dual-colour grey on white supplied by SG Windows and manufactured in Swish, were specified by developer Inglerock to provide an enhanced level of noise insulation, achieving a reduction of 39 decibels (RW39dB). Neil Rogers, managing director and owner, Inglerock, said: “The acoustic insulation was very important to us. We’re not very far away from a dual carriage way and we didn’t want that to impact on the living space. For that reason we specified a high level of wall insulation – 120mm behind double thickness plasterboard – roof insulation, including a sedum roof and high performance windows. A Swish-approved commercial manufacturer, SG Windows, manufactured and installed a total of 13 high performance windows to the project. Alongside the thermally efficient Swish frames, these featured specially developed acoustic DGU manufactured from an 8.8mm sheet of Standip Silent Glazing, 14mm cavity and 6mm low-e thermal glass. 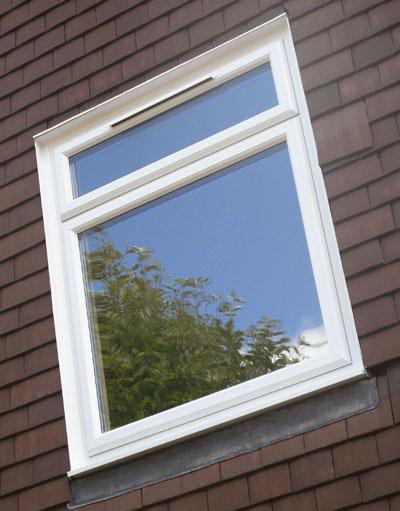 Installation and manufacture were also made more challenging as SG Windows had to accommodate an 11º curve in windows installed at the front of the property. Steve Rubotham, director, SG Windows said: “Part of the front of the building actually curves, including one window aperture. 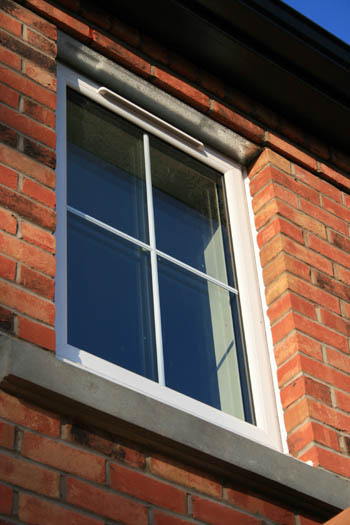 The large window at the front of the building is consequently manufactured from three separate products fitted on a pre-welded cill and then joined with coupling bars. The building also features a heat recovery and ventilation system. This meant that windows could be designed and installed without the inclusion of trickle vents which would have impacted on the effectiveness of sound proofing. Swish Window and Door Systems triple glazed system has been specified on a new social and affordable housing project in the North West of England. New bead options mean Swish is able to offer a window system which can accommodate a 44mm triple-glazed unit, capable of achieving U-values as low as 0.8W/m2K, supporting specifiers in achieving Code Level 6 and beyond. Appointed by Riverside Housing Association, lead contractor Story Construction, selected Swish fabricator World Group to supply 240 triple-glazed high performance windows to a 30 property development in Carlisle. Delivered to a Code Level 4 standard the development of two and three bedroom properties, also included a Secured by Design specification. Also supplying doors to the project, World Group managing director, Cliff Spooner, said that he expected to see growing demand from the commercial sector for high performance products. He said: “We came on board with Swish 18-months ago because we saw value in the brand but also that we could deliver an exceptionally high level of thermal performance and achieve it affordably. Tested on an industry standard side hung fixed combination 1230mm by 1480mm window, the development of its triple-glazed option by Swish has included hardware trials and also full opening/closing cycle testing, to ensure performance. Dachs mini-CHP from Baxi-SenerTec UK, part of Baxi Commercial Division, has been identified by Dundee City Council as a consistently cost-effective element of its drive to achieve energy efficiency. Dundee is creating a sustainable energy infrastructure for the long-term. The City Council has trialled different renewable and low carbon alternative heating technologies and the Dachs mini-CHP combined heat and power solution is being variously deployed in the city, reducing carbon emissions and improving the energy efficiency of buildings of diverse use. The Dachs mini-CHP solution is designed to run continuously in buildings with a large heat load and almost continuous operation. 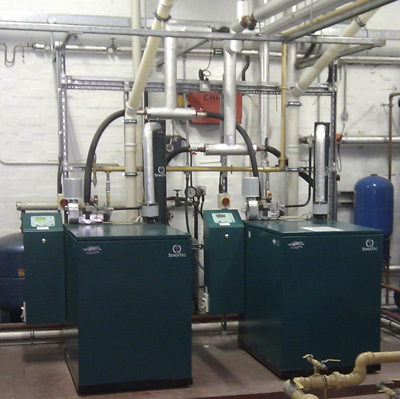 For example, in Brington Place, a home for elderly residents where the heat load was being met by three condensing boilers, the operation of a Dachs mini-CHP greatly reduced the call on the boilers to supply the heat load, while generating electrical power to meet the power load. The CHP unit, running almost continuously, has delivered 66,000 kWh of electricity and 160,000 kWh of heating since being commissioned. Based on previous bills for electricity from the grid, the savings for the council run home amount to almost £2,500 per annum. These savings do not take into account the benefits that will be derived from the extended operating life of the boilers due to greatly reduced use, the consequential reduced maintenance costs and the reduced carbon emissions. The cost-effectiveness of CHP has been confirmed by its use in the plantroom serving the council-run library, theatre and office areas in the Wellgate Shopping Centre in the heart of the city. Two Dachs mini-CHP units were deployed to support six boilers that were already in place to meet the heat load. In an 11-month period following installation, the two units ran for more than 5,500 hours, generating almost 69,000 kWh of electricity and well over 100,000 kWh of heating. The dramatic reduction in boiler workload and the considerable lessening of the grid-supplied power demand, together led to a saving of over £4,000 in running costs. In addition, the two units have jointly avoided nearly 24,000 kg of carbon emissions. The Netherlands Institute for Ecology is now housed in a purpose-built timber and glass building designed to the highest standards of sustainability, and Arch Timber Protection’s fire retardants are safely protecting the building and staff at the site. Timber is a crucial and significant element in the new building and thermally-modified Plato Wood, produced from sustainable spruce, has been used for external beams and cladding. These components are protected using Arch’s NON-COM exterior, a polymer-based fire retardant to provide a proven and highly effective surface spread of flame protection. Interior Plato Wood spruce timbers used in the public areas of the building are also fire retardant-protected with Arch’s Dricon, a water-based fire retardant treatment. The timber and the Dricon treatment have been supplied by Foreco Dalfsen. The timbers for NON-COM Exterior protection had to be accurately produced and then carefully shipped in segments to the UK, treated by Arch and then shipped back to the site for construction. 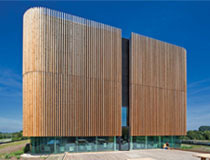 Claus & Kaan Architects designed the building according to the cradle-to-cradle (C2C) ecologically-sound building concept. Balfour Beatty Engineering Services (BBES), is set to begin a £3.5 million mechanical and electrical (M&E) services contract for the new £9 million Beatson Translational Research Centre (TRC) in Glasgow. Being constructed by Mansell, a Balfour Beatty Company, for the University of Glasgow, the project will see the creation of the new four-storey research laboratory, office building and car parking facilities. The project’s M&E services have been designed by mechanical and electrical building services engineers, KJ Tait. The M&E services which are being delivered by Mansell, incorporate a number of sustainable elements including high efficiency turbo chiller and air handling units with Econet heat recovery packages. To further minimise the environmental impact of the project, BBES has incorporated offsite manufacturing for the modular risers and the plant room. Using the latest lean construction methods and off-site manufacturing techniques, BBES will prefabricate the modular risers and plant skids, before delivering to site ready for a faster, more efficient and safer installation. Manufactured by BBES at its Modular Systems + facility, this will allow site construction to run concurrently with manufacturing. As well as reducing working hours on site, including hot works and working at height, this approach will also reduce material waste while ensuring quality control through manufacture in a controlled environment. Other M&E services that BBES will supply and install on site comprise full air conditioning, BMS controls, fume and MSC exhaust systems, RO water, medical gas systems, UPS and generator standby systems, small power and lighting systems. The project further demonstrates BBES’ commitment to delivering sustainable projects in terms of efficient and low environmental impact delivery as well as the creation of low energy in use buildings. 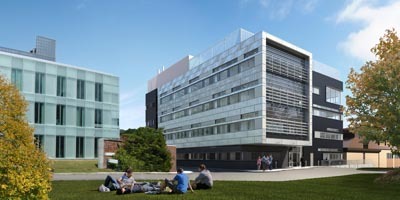 Work on the Beatson Translational Research Centre is expected to be complete in summer 2012. 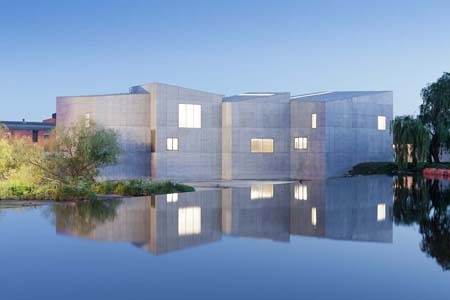 For the largest purpose built exhibition space outside of London and one that is literally built into a river, the stunning new gallery, The Hepworth Wakefield, is a work of art. With its prominent site at the head of the fast flowing River Calder, this modern building pushes the tolerances of architectural design. To protect against the external environment, including cold transfer from the river, and create the perfect internal environment for visitors to the gallery, high performance insulation was required. PIR manufacturer Celotex demonstrated it had a range of solutions that would provide the thermal performance the gallery required. Designed by award winning architect David Chipperfield and built by main contractor Laing O’Rourke, the 5,000m² gallery will play a vital role in the redevelopment of the Wakefield Waterfront. The two-storey building is formed from a conglomeration of 10 individually sized trapezoidal shaped blocks, responding to the scale and rooflines of the surrounding small scale industrial buildings. The steel framed concrete building has been designed to withstand the impact of a fast flowing river and as such the walls had to be reinforced to almost reservoir standard. The gallery walls float 30 millimetres above the floor, so hidden supports had to be constructed to support the magnesite floor. For a project where it was essential to protect the structure from the elements particularly the cold river water and fluctuating water levels, subcontractor Crown House installed 2,300m² of 75mm thick GA4000 as lining for the concrete walls and 1,800m² of 50mm-thick Celotex FF4000 as high performance thermal insulation for the underfloor heating system. Made from PIR (polyisocyanurate) with foil facers for improved emissivity, Celotex GA4000 and FF4000 both achieve an excellent lambda of 0.022W/mK, and have a confirmed low environmental impact through its BRE Approved Environmental Profile. Celotex GA4000 has also been awarded an A+ rating when compared to the BRE Green Guide 2008. When it came to floor insulation, 50mm thick Celotex FF4000 was laid on the structural base then covered in poured concrete. Designed for use in internal underfloor heating applications, Celotex FF4000 is available in a broad range of thicknesses from 50mm to 125mm and in a board size of 1200mm x 2400mm. The 75mm-thick Celotex GA4000 was used in the cavity walls of the steel-framed building – fitted between the external concrete walls and internal block walls. These durable and extremely lightweight boards, available in a range of thicknesses from 50mm to 100mm and a standard board size of 1,200mm x 2400mm, are easy to cut to fit using hand tools making them ideal for a speedy application. Glazing elements by Kawneer have helped the first phase of the redevelopment of the city centre campus of the University of Wales Newport achieve a BREAAM ‘Excellent’ rating. Kawneer’s AA100 curtain walling, AA601 top-hung casement windows, and AA605 low/medium duty swing doors and series 190 heavy-duty commercial entrance doors, which feature on all elevations of the striking building, have also helped BDP architects achieve the design objective of it being open and transparent to the community. 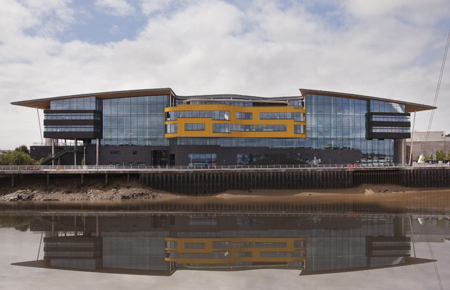 The £35 million building on the banks of the River Usk, next to the city’s new landmark footbridge, houses the University’s Faculty of Arts and Business. This creates a magnet for cultural activity along the riverfront as well as a centre for enterprise that embraces a contemporary arts centre, extensive exhibition space and a national photographic archive. A collaboration between the university, city council and Newport Unlimited, the urban regeneration company for the city, the new campus is part of a major redevelopment of Newport’s city centre. The glazed elements were installed by approved specialist contractor AB Glass for main contractor Willmott Dixon Construction who specified Kawneer systems with secondary steelwork to achieve the required spans (typically 10.5m at ground floor and up to 17m at first floor). A BDP senior architect said this combination was in preference to a steel curtain wall system as it was the “most economical solution”. She said: “Until working on Newport, the design team had thought that a steel curtain walling system would be the most economical solution for large spans as it negates the need for secondary steelwork. But current market trends are proving that aluminium and secondary steelwork is just as competitive and a solution favoured by contractors so will probably be specified more and more very early in the design. The Kawneer systems interface with brick, zinc and timber soffit. In semi-circular floating pods suspended from the first floor slab at the front of the building, much attention was paid to the isolation of these structures and the curtain walling to minimise movement on the latter. And at roof level, the glazing disappears above the timber soffit to give the effect of the curved roof floating over the building. By extending the curtain walling in this way and concealing it, BDP was able to step the top transoms to follow the roof line rather than having it curved if it was exposed. 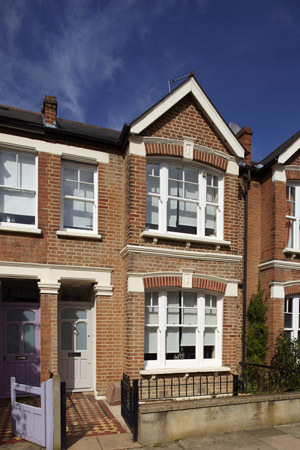 A solid brick, Edwardian terraced house in Balham has been transformed into a model of 21st Century energy efficiency. 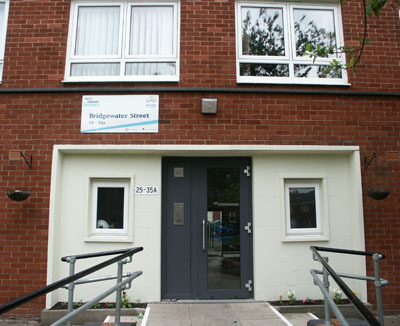 The project (funded through the Technology Strategy Board’s ‘Retrofit for the Future’ competition, a programme to kick-start retrofitting of the UK’s social housing stock), aimed to refurbish the property to near Passivhaus standards, while causing as little impact to the aesthetics of the building as possible. Social housing provider, Family Mosaic, the owner of the property, engaged architects, Prewett Bizley, for the job. Prewett Bizley is a member of the Passivhaus Trust and the company’s project designer, Robert Prewett, is a Certified Passive House Designer. Energy performance targets for the programme were based on an 80% reduction in CO2 emissions from a baseline of 97kg CO2/m².yr (typical of a 1990s 80m² semi-detached house). Achieving such rigorous standards called for the internal fabric of the property to be stripped back, to identify and tackle potential air leakage problems. Then a continuous air tight, high performance internal thermal envelope was constructed – the key to the refurbishment’s excellent energy efficiency, according to Robert Prewett. He added: “If it is to work, the internal lining must be continuous, otherwise it’s like wearing a jersey with holes in it – heat just escapes. You need excellent insulation and it must be very air tight, so all joints have to be taped. When specifying, we looked at the performance we required and tried to find the product best suited to those requirements. In the first floor ceiling, just 70mm of Kingspan Kooltherm K7 Pitched Roof Board formed the base layer of the property’s continuous lining. The premium performance insulation – which, due to its closed cell structure, has thermal conductivity of only 0.020 W/m.K at 70mm thickness – was tacked to the underside of the existing timber joists, contributing to an overall U-value of just over 0.10 W/m2.K. Kingspan Kooltherm K3 Floorboard supplied the underfloor insulation for the property. The BRE Green Guide A+ rated board, which is specially designed for ground floors, was fitted between the joists of the suspended timber floors. Careful detailing contributed to the high standard of air tightness for the refurbished property and, ultimately, to a U-value for the insulated suspended floor of 0.12 W/m2.K. Tenants moved in to the property in February 2011. Since then the ventilation heat recovery system has provided the sole heat source for the building, and the meagre number of radiators in the house (a heated towel rail purely for comfort and three other radiators installed as a back up in case the mechanical system’s performance was less than expected) have, according to Robert Prewett, not been used. “My prediction is that, in future, about 28 kWh/m2/yr of energy will be required for this property, which is very close to the Passivhaus EnerPHit refurbishment standard – and a molehill in comparison to the mountain of energy this type of house would normally use,” he said. The Balham property, like others funded through the Retrofit for the Future competition, will be evaluated over a two-year period by the Energy Savings Trust and the potential for low-cost implementation in volume across the UK assessed. Advanced performance thermally efficient windows, featuring frames manufactured solely from recycled PVC-U, have been supplied to a Birmingham sheltered housing scheme. Manufactured by Framexpress and installed by Berben Group, 128 recycled windows were specified by Yardley Great Trust at its Foliot Fields site, a supported living scheme for older people. Made using the new recycled low carbon Reco22 window framing system from Profile 22, the carbon footprint of the extruded window profile is just 6% of that manufactured using virgin material. Reco22 is the first window system to secure a dedicated A+ rating across all domestic applications from the BRE earlier this year, according to the company. Lynn Bailey, housing manager, Yardley Great Trust, said: “We try to instil a positive approach to sustainability in all of our activity from supporting residents in reducing waste to working with local suppliers and the specification, wherever possible, of products that we feel fit with our own commitments to the environment. The 31 properties at Foliot Fields were built by Yardley Great Trust in 1984. A registered charity, the Trust was founded in 1355 and aims to relieve poverty through grants, as well as providing care and housing to older people throughout the Birmingham area. Reco22 was launched by Profile 22 last year. In addition to cutting the carbon footprint of extruded framing material to just 6% of that of virgin material, a triple glazed option means that Reco22 delivers an advanced thermal performance achieving U-values as low as 0.8W/m2K. Wakefield Metroglaze has played a key role in a landmark Retrofit for the Future project in Nottinghamshire which provides a model for upgrading a common 1950s and 60s house type. The company supplied and installed high performance triple glazed Sheerframe casement windows, plus a Masterdor Thermal 54mm, triple glazed door-set, at Mayfair Place in Tuxford, Newark where improvements aim to achieve an 80% reduction in energy use of the A1 Housing property. Very low U-values of 0.8 W/m2K for the Sheerframe windows and 1.0 W/m2K for the Masterdor Thermal door-set were instrumental in delivering a highly insulated building envelope. 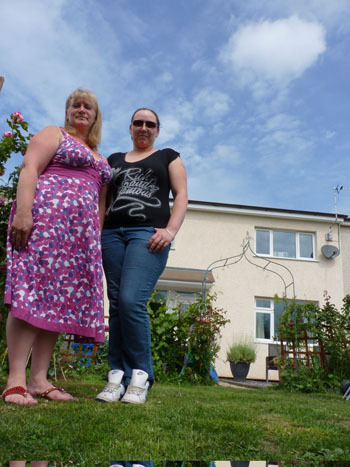 This refurbishment project was entered into the Technology Strategy Board’s Retrofit for the Future competition by A1 Housing, the Almo of Bassetlaw District Council which manages 7,000 homes in Nottinghamshire. One of the reasons the Mayfair Place house was selected for the competition was because the mid-terrace property is of Multi Frame Construction (MFC). This was a common non-standard construction method during the 1950s and 60s which means there are numerous other homes of this type across Bassetlaw and managed by RSLs nationally. The property is constructed with a concrete structure on the ground floor and timber frame for the first floor and pitched roof. One of the most important steps taken to bring the property was brought up to 21st century low carbon standards was to significantly improve the thermal performance of the building fabric through greater wall, floor and loft insulation plus new windows and doors. The thermally superior building fabric combines with a number of features designed to minimise energy usage including an air source heat pump, photovoltaic (PV) panels, a mechanical ventilation and heat recovery (MVHR) system and low energy appliances and lighting. 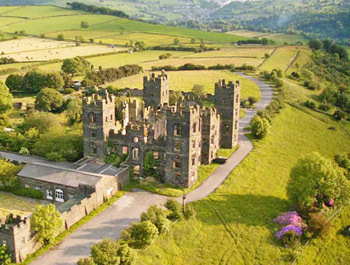 A new single-layer tapered roofing insulation system designed by Gradient Flat Roofing has been included as part of a major package of works to convert an historic Derbyshire ruin into a block of 26 luxury apartments. Gradient was chosen for the quality of product and the level of customer service it could bring to the Riber Castle project in Derbyshire. “This was not a particularly complex project as the original roof had disappeared completely and a new one had to be built,” explained Gradient’s Steve Adams. A liquid vapour control layer was first laid over the new 8502m roof deck before Gradient’s foil-faced PIR boards were used to create a tapered, single-layer insulation system. The roof then received a layer of Oriented Strand Board to allow it to accept high levels of foot traffic, before a final three layer resin-based GRP waterproofed system was added. “With our single-layer system we are able to manufacture each piece of the insulation under controlled conditions at our manufacturing plant. This means that individual boards can be created to fit specific locations on the roof and the quality levels remain very high,” Steve said. At Weser-Stadion in Bremen, the largest building-integrated photovoltaic installation in Germany has enabled the generation of enough power to meet the annual demands of 300 households – and it could set a precedent for similar UK stadium applications. Located in the north of the country and home to football team Werder Bremen, Weser-Stadion is the latest German football stadium to improve its environmental performance following the delivery of previous ‘green’ sports facilities in Freiburg, Augsburg and Stuttgart. Covering approximately 60% of the total roof area, some 1,735 Evalon Solar panels were installed around the outer ring of the new stadium roof. This provides a full capacity output of 511 kWp and contributes to the total stadium output of more than one million kilowatt-hours of electricity per year. 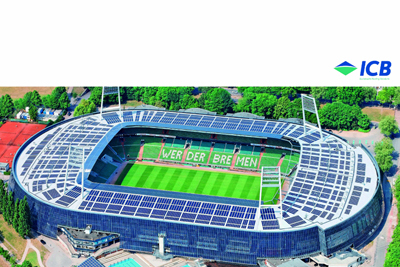 ICB (Solar), a Microgeneration Certification Scheme (MCS) approved Solar PV installer, designs, supplies and installs solar PV systems from its base in Bournemouth and believes that the Weser-Stadion project could set a course for future large scale stadium installations in the UK. As part of a redevelopment programme at the Weser-Stadion to improve spectator experience by moving seating closer to the football pitch, the new-look stadium would also include a brand new roof. Integrating a 1.2MWp photovoltaic system into the shape and design of the building and roof – this has helped to reduce annual CO2 emissions by 450 tonnes. Over 10,000m2 of Alwitra Evalon Solar – a power-generating waterproofing membrane – was installed onto the roof of Germany’s Weser-Stadion. Each membrane was mechanically fastened to the sheet metal roof using stainless steel screws, before being connected in the seam area using a hot-air welding process. The fastener spacing on each individual roof area was determined according to the results of a wind load survey, with the resulting data forming the basis of the fastening plan.